My Cluttered Corner: BIG Simple Stories GIVEAWAY - I Got Caught Up in a SN@P! 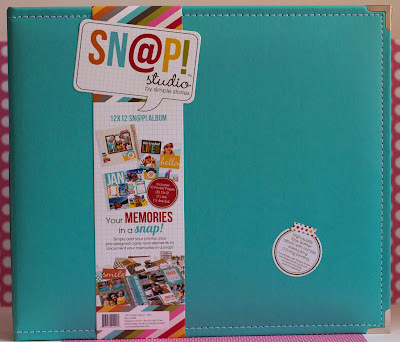 BIG Simple Stories GIVEAWAY - I Got Caught Up in a SN@P! and a few SN@P sets as well as some other Simple Stories papers and embellishments and got to work. I seriously LOVE this album. It is gorgeous. This album is constructed really well. The stitching and metal corners are such a nice touch. And here is how my new album looks now that it is nice and caught up! I started by using the Family and Girl SN@P sets to work on a spread for August. You should know that in my version of Life Documented I dont always do one spread each week. 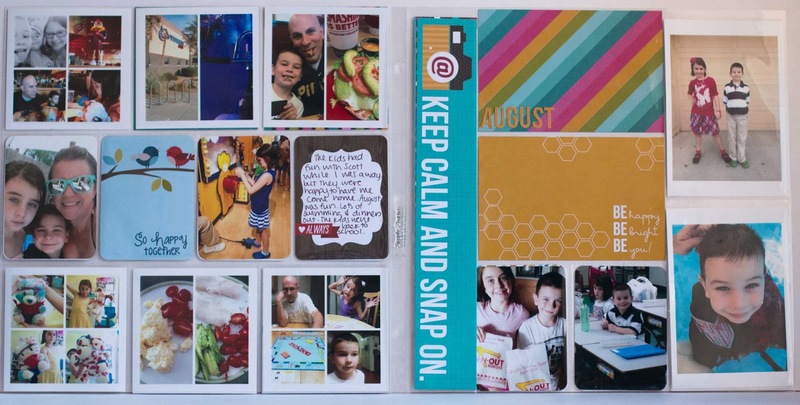 I usually use my phone photos (since my camera photos generally end up in regular scrapbook pages) and the number of spreads I do really depends on how many photos I take that month. The variety of layouts in the pack of Pocket Pages made it really easy to work with 3x4, 4x4 and 4x6 photos. Here is more August on the left and the beginning of Septmember on the right. 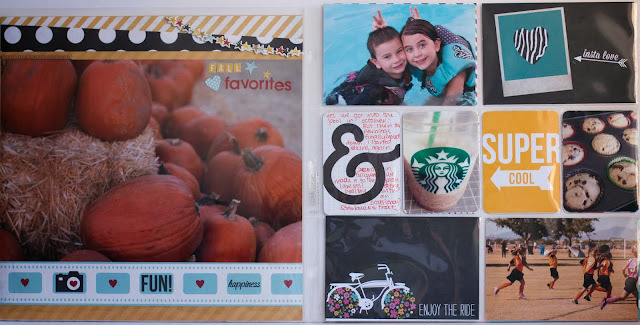 For this spread, I used the Girl SN@P set and some SN@P Studio papers and stickers too. I continued September with this 2 page spread that mainly used the Family SN@P set and a flair from SN@P.
Here, the left page is the end of September, while the right 12 x 12 layout is the introduction to October. 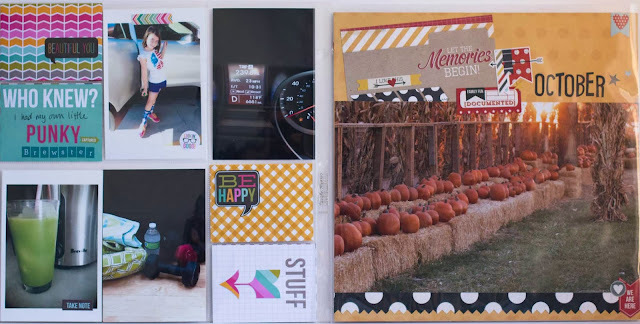 I used the Simple Stories Say Cheese collection for October's intro layout. 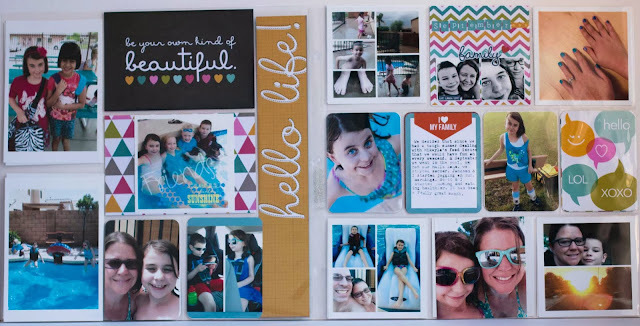 Since I needed another 12 x 12 layout for the back of that right hand page to start this spread, I used another enlrarged photo and more Say Cheese and the right side I went back to another Pocket Page spread. I think it is fun to mix it up! So there you have it! In a SN@P I am all caught up! So tell me....would you like your very own Simple Stories album and set of pocket pages!!!!???? 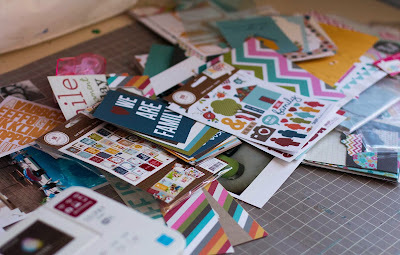 If so, tell me if you are into the Pocket Page scrapping and if so, are you up to date or woefully behind? Leave me a comment and you will be entered into a drawing for 1 Simple Stories Album and 1 Set of Pocket Pages! (***BE sure to leave me your email address so I can contact you if you win!!! ***) Would you like a second chance? Then follow my blog and leave me a comment letting me know you now follow or already did follow. This giveaway IS OPEN to EVERYONE including international winners. I will leave the comments open until Friday. Thanks for stopping by! WOW---great giveaway! I have not started Pocket Page scrapping yet...I really, really want to...but I guess you can say that I am far behind...! Your album is awesome---makes me want to start one so much! I have been a follower for awhile now! I have been a follower for a long time. I really enjoy your PL posts. I love the album and the way your finished pages look. I have 13 weeks worth of photos on the way so I a, keen to find a quick solution. Your pages are wonderful Rebecca!!! I just love how you made smaller collages in the 4x4 size pockets. That's a great way to include tons of photos. After being in a serious scrapping rut this year, I finally am getting back into it with pocket pages. I am woefully behind (like 2 years behind!!) but am looking forward to catching up slowly and getting my mojo back. 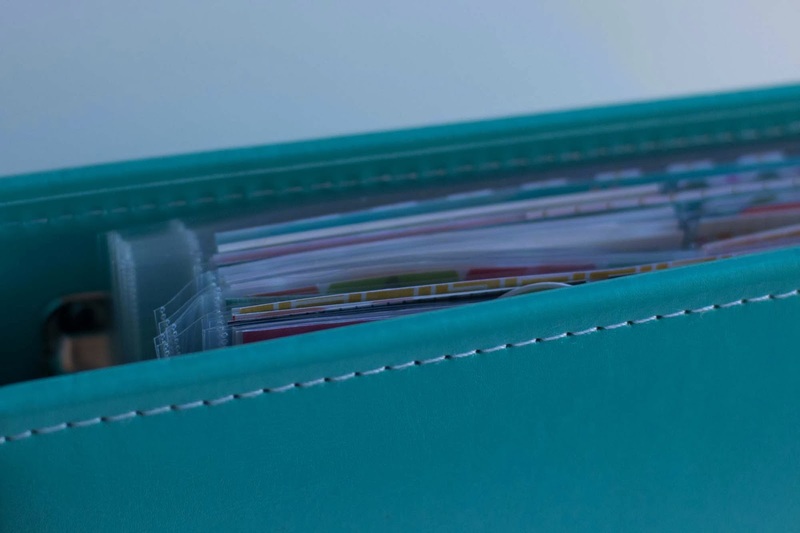 Simple Stories makes such fun and functional products!! And i'm already a follower! Thanks for the great chance to win! Congrats on catching up, gorgeous project! Love how you mixed oversized photos into the album. Thanks for the chance to win! This rocks girl!!! Fabulous work! Love your album. I think an album like this might help me finally finish my Disney album. Thanks for the chance to win! I've been following your blog for a long time. It's great! I just started to understand the joys of PL and Sn@P. I really love how fast you got caught up and the great layouts you have created using your SN@P pages. I have been a follower for awhile now. Thanks for a chance to win. I started traditional PL as of August when our 6th was born. As of today I am completely up-to-date and really loving it! Thanks for a chance to win. Oh this is my second post for being a follower! And..now I am a follower and happy to join the ranks! Wow - You have inspired me! 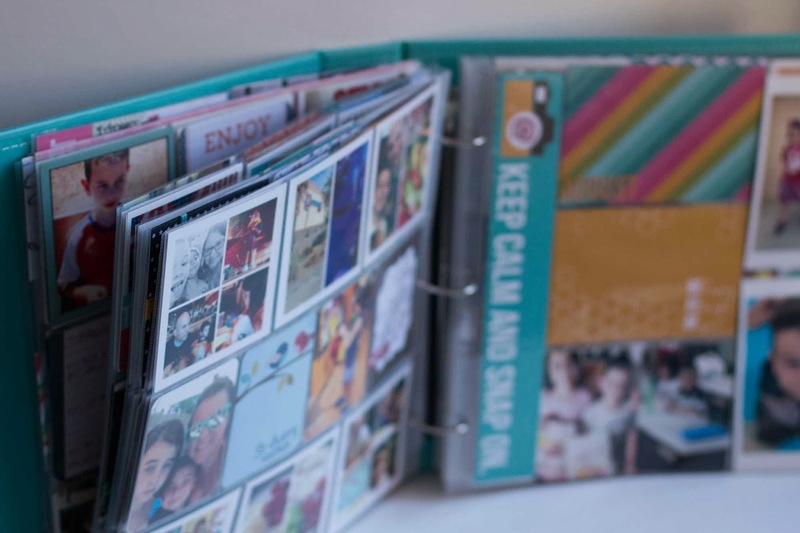 I really need to get moving and get all my photos into pages and albums! I did well the first 3 months of the year, and have really slacked off the last 6 months! Thanks for the push! and the giveaway! Would love to win!